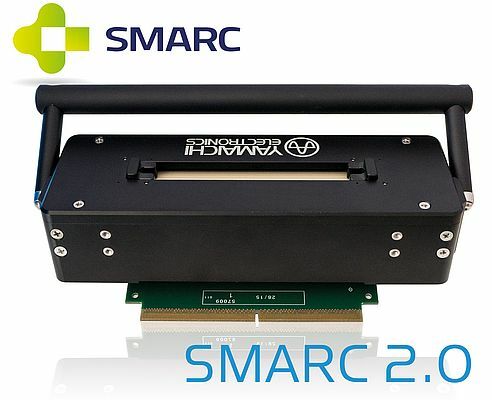 The test adapter for the SMARC computer-on-module standard, developed by Yamaichi Electronics, is also suitable for the current version SMARC 2.0. The test adapter realises the perfect alignment of the contacts and allows for 100% contacting reliablity. Due to the use of spring probe pins very high contact cycles can be reached. SMARC stands for Smart Mobility ARChitecture. It is a specification published by the Standardization Group for Embedded Technologies e.V. (SGET) for computer-on-modules (CoMs). Its advantage is the low power consumption of the modules due to the implemetation of ARM or other low-power processors. Yamaichi Electronics´ SMARC test adapter is an impedance controlled test system according to the SGET SMARC specification. It is durable and highly reliable as a contact system. As it is volume test ready it can increase the test output considerably. Thus, it reduces the cost per tested module. Furthermore, its operation is easy and secure. This test adapter within the YED900 series of Yamaichi Electronics´ test adapter series can be used for applications like evaluation bench tests, module programming and reliability tests from -30°C up to +85°C. The socket is designed with compression mount technology (CMT), therefore no soldering is needed. Selected materials like aircraft aluminum, PEEK and ceramic PEEK make the adapter robust. The test adapter can be used as “plug and play” suitable test vehicle. SMARC modules have gold pads as contacting surface. The best contact technology for such surface areas are fine pitch probe pins. The pins, known from semiconductor testing, have a very long life time. The life time for the SMARC test adapter is specified up to 50k mechanical cycles. For contacting the module pads, a conical type plunger tip is commonly used. By using such a tip it can be assured that only a very small witness mark is formed on the module contact pad.